I may have mentioned this before, but my first love in writing was not fiction, but poetry. I was seduced by the rhythms of beautiful sentences and the images a good metaphor evoked. By the way language could move beyond the literal to make me see things as I’d never imagined them. And though fiction seduced me for entirely different reasons, that love of poetry remains. It continues to inform how I read; the stories I love most combine plot with breathtaking language. These are the types of stories I admire and aspire to. After all, is there anything more beautiful than lyrical prose and page-turning, unputdownable narrative? If I could have any superpowers as a writer, it would be those two. But (as someone once told Spiderman) with great power comes great responsibility. …She rushed into his arms like a coin does to a magnet. 2. When you do include a gorgeous, perfect, there’s-no-other-way-to-say-it metaphor, let your reader savor it. Don’t feel the need to follow up with another one asap while they’re still relishing the image of the last one. As a reader, I stop and catch my breath for certain lines of prose, but eventually, I do want to know what happens next. 3. Pack your punches in the right places. 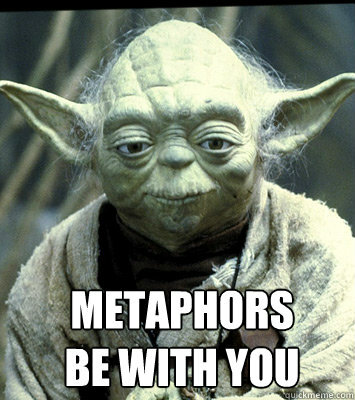 A good metaphor, done right, is powerful. It can linger in a reader’s mind, it can change how they see something. This draws an incredible amount of attention to the person, place, or concept it’s describing, so make sure you’re doing it with meaning. Does the lone bat in the middle of a baseball field deserve that much of our attention, or is it really just a bat little Timmy forgot? Overusing metaphors in places where they’re not entirely necessary dilutes the power of those that really serve a purpose. 4. Don’t mistake purple for pretty. There’s beauty in crisp simplicity. In clarity. Whether you’re going for a lyrical line or a straight-forward sentence, it still needs to say what it needs to say. Those fancy-sounding sentences we’re most proud of are often the ones that deserve our most scrutinizing edits. 5. And finally…Don’t insert a picture of Yoda from Star Wars into a blog post that references Spiderman. Do you read for language, plot, or both? I think this is pretty much exactly the kind of writer that I’m not. So, I’m probably safe from abuse in this area (you can’t abuse powers you don’t have 🙂 ). I just searched my current story for “as if” and there wasn’t a single metaphor. I did have a couple of “This was like that” constructions, but they were very literal. As I get older, my writing gets simpler and simpler (and it wasn’t _that_ fancy to begin with). It’s not better or worse than metaphors and beautiful sentences — it’s just what my fingers naturally produce. I wrote about this on my blog a while back: http://u-town.com/collins/?p=3144. I couldn’t agree more about reading for whatever the writer has. Some of my favorite books are by writers who make minimalism an art—I never knew so few words could say so much. I am in awe of that kind of writing. I could never write like Henry James, but I see exactly how he’s doing it. I see a play by Harold Pinter, and it’s like magic. So few words in some of the plays, very few characters, no back story (or at least no reliable back story), no resolutions, and when the curtain falls I’m sitting there with my mouth open. I love that image of you with your mouth hanging open after the curtain falls. I’ve felt that way about certain passages; like they just stunned me and I have no way of expressing how deeply they’ve affected me. I had a feeling you’d be in the “I love metaphors” team, Heather. There’s something about their rhythm that, when done right, enchants me. I love the Valley Girl reference! I’m all about a good metaphor (literature major speaking, Masters in English), but yeah, they can get clunky. Writing police-procedure really cuts this down for me. Cops don’t usually talk in metaphors. But I do appreciate a good one. In the wrong blog post he is. The Force is strong with this post. I don’t read much poetry but when I do I love the simple ones where I don’t have to open a dictionary to understand. That’s why E. E. Cummings is my favorite poet. I prefer having both when I read. But I’ve noticed I’ll read a book even if the writing is okay and the plot is good. But the opposite doesn’t really work for me. That’s a really great point, Violet. Beautiful language is nice, but something has to be happening to keep the pages turning.